While mother's milk is the best food for newborn piglets, it's not always available. 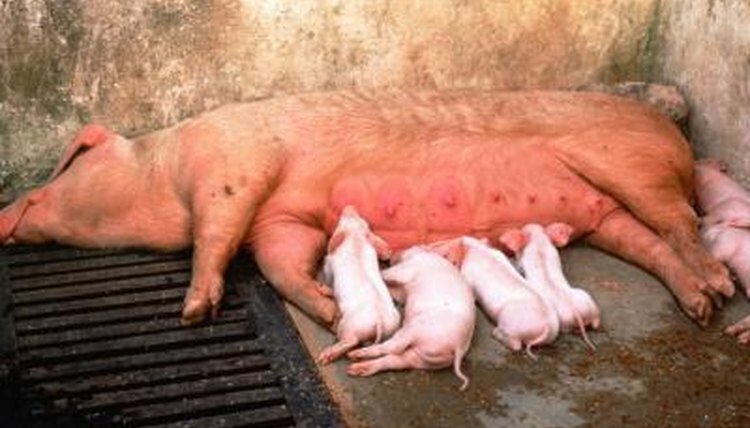 A sow might die giving birth or may have so many babies she can't nurse all of them. In the latter case, you must make the decision whether to remove the larger piglets for hand-feeding because they are stronger and more likely to survive, or remove the small ones who might not survive hand-raising but are less of an economic loss. If newborn piglets can't receive that vital first milk called colostrum from the sow, the odds of survival aren't good. Piglets are born without immunological protection; the colostrum's antibodies are an absolute necessity. If your sow is expecting, keep some frozen colostrum on hand in case of emergency. Your vet can provide you with it or let you know of local sources. If porcine colostrum is unavailable, use bovine colostrum as a substitute. On their second day of life, after consuming sufficient amounts of colostrum, piglets can start drinking sow milk replacer. Make up fresh batches of this replacer daily, following the container's directions. Discard any replacer you don't use within 12 hours. In an emergency, you can put together a homemade milk replacer. A North Carolina State University website recommends a replacer containing a minimum of 8 percent to 10 percent fat and 24 percent to 28 percent protein. The NCSU recipe for homemade sow milk replacer consists of 1 quart of cow's milk, 1 pint of half-and-half, a raw egg and 4 cubic centimeters of the antibiotic neomycin. Baby piglets nurse roughly 15 times in their first 24 hours of life, according to the Oregon State University Extension Service website. Each nursing episode lasts about five minutes. That's a huge time commitment for a person, so try to enlist others to help you for a few days. By the age of 1 week, piglets need feeding every 3 to 4 hours. If you want to get some sleep, most week-old piglets will be fine with a midnight feeding followed by one at 6 a.m. At 2 weeks, feed piglets four times a day. Start them on solid pig chow about the age of 3 weeks, but continue nursing them at least 3 times daily until the age of 5 weeks, when they wean. You might have to feed newborn piglets with an eyedropper, at least while they receive colostrum. When they start drinking replacer, you can transition them to a bottle or put the liquid in a flat dish. The Oregon State website recommends using a syringe and rubber tube, drawing between 10 and 15 milliliters of the replacer into the syringe for each feeding. Lubricate the tube and put the end on the piglet's tongue, allowing him to swallow. Once the tube is safely ensconced in the mouth, attach the syringe and slowly administer the replacer. Along with proper feeding, it's essential that newborn piglets stay warm. For their first two weeks of life, piglets can't produce their own body heat. The newborns require an environment where the temperature is about 90 degrees Fahrenheit. You can use safety heat lamps or pads to ensure the babies remain warm enough. Keep them away from drafts.